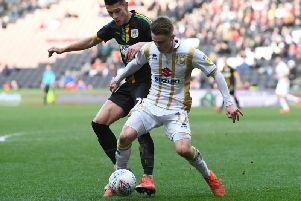 MK Dons want to progress and be in with a chance of winning the Checkatrade Trophy, says striker Robbie Simpson. Dons won the competition in 2008 in it's guise as the Johnstone's Paint Trophy, ironically beating Grimsby - the side who knocked Dons out of the FA Cup on Saturday. Victory in Tuesday night's game against Brighton U21s will only see them progress if Peterborough do not beat Luton in normal time. Paul Tisdale has so far used the competition to blood his second string, and while Simpson hopes to be given a start against the Seagulls, the striker knows it's a competition the club are not taking lightly. "It's a competition I know Tis and the whole club wants to progress in and wants to win," he said. "That's in the forefront of everyone's minds. "Tuesday night is a big game for some – i'm not sure what Tis has planned yet, whether he will play a few players who haven;t been getting a lot of game time... I hope so, personally!" The clubs met in last season's competition, and Dons cruised to a 2-0 win at Stadium MK, with goals from Gboly Ariyibi and Aaron Tshibola.